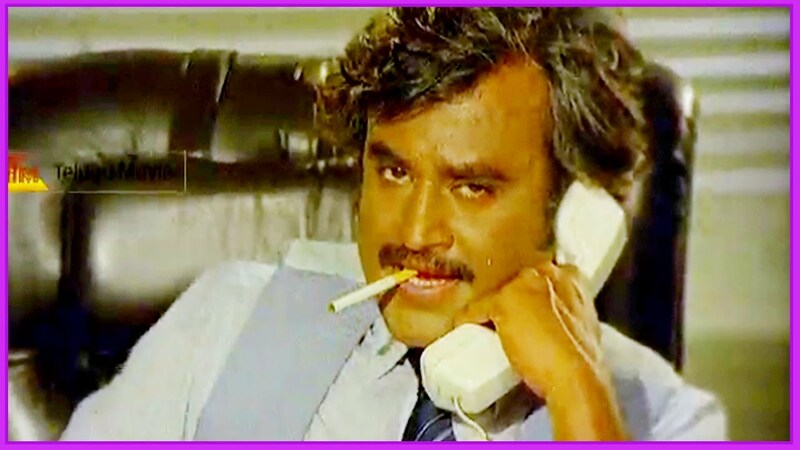 Shivaji Rao Gaekwad, Rajinikanth 12 December 1950, Bangalore, India. Is an Indian actor and producer with a fanciful early and with great success thanks to its ability to adapt to changing times. Bangalore bus driver while studying for his performance diploma in Madras Film Institute. Since his debut with (Apoorva Raagangal,1975) began to participate in several Tamil films. Not only it is allowed to be the hero but also became a worthy antagonist in the film (Bairavi,1978) making up the nickname Superstar. That nickname pursued him throughout his career where he alternated absolute role or shared in all his other films. During the 80s was the age of experimentation of the artist in which he won successes that occurred later that remakes were made in other languages. In 1985, reach his 100th film, Sri Raghavendra in which he played the Hindu saint Raghavendra Swami. Even though his major success was his 101st with the film Bewafai. In the 90’s when his popularity reached the top to join mutiple commercial projects and sharing the stage with stars like Amitabh Bachan. But not until the 2000s, this time after several breaks argues with irregular activity, but it is when we appreciate its evolution and adaptation of himself to the new time as (Sivaji the Boss, 2007), playing an idealistic businessman disgusted with their surroundings, the film is a stunning explosion of color and rhythm. (Enthiran,2010) Here plays a scientist who must confront his most valuable invention. This film contains some of the most emblematic recent special effects scenes of the Indian film industry. Come out a minute as the protagonist of (Enthiran,2010) “Chitti” on the film starring by por Shahrukh Khan y Kareena Kapoor (Ra One,2011) . He is the only superhero able to save another superhero. Magnificent. Currently with 64 years he continues to demonstrate its power and its ability to adapt risking movies with fully modern and innovative techniques. (Kochadaiiyaan, 2014), an animated film by the technique of motion capture that dramatize medieval battles.The narrative follows the quest of an 8th-century warrior who seeks revenge after witnessing the unlawful punishment administered to his father, a good-hearted warrior in his kingdom, by the jealous ruler. En 1985, alcanzó su película número 100, Sri Raghavendra en la que intepretaba a un Santo Hindú Raghavendra Swami. Aunque su mayor éxito fue su película 101,con Bewafai. Cuando su popularidad alcanzó la cima en los 90’s se unió en participar en diversos proyectos como comerciales, compartiendo escena con con superestrellas como Amitabh Bachan. Pero hasta el 2.000, se acontecieron varias interrupciones provocando una actividad irregular en su carrera, pero a raíz de ello se acontece la evolución y adaptación de sí mismo en (Sivaji the Boss, 2007), interpretando a un idealista hombre de negocios decepcionado con su entorno, la peícula es una despampanante explosión de ritmo y color. (Enthiran,2010) Aquí lleva a la vida a un personaje científico que se enfrenta a una encrucijada entre sus logros profesionales y emocionales mas valorados. Esta película contiene algunos de los más emblemáticos y recientes efectos visuales desarrollados en la India. Hace un “cameo” como personaje de (Enthiran,2010) “Chitti” en la película intepretada por Shahrukh Khan y Kareena Kapoor (Ra One,2011) . El es el único superheroe capaz de salvar a otro superheroe. Magnificent. Actualmente con 65 años el continúa demostrando su poder y su habilidad para adaptar arriesgadas películas con modernas e innovativas técnicas. (Kochadaiiyaan, 2014), Una película animada por motion capture que relata batallas medievales. La narrativa relata la conquista de un guerrero del siglo octavo que busca tomarse la venganza después de presenciar injustos castigos administrados a su padre, un guerrero de buen corazón pero a la vez un celoso gobernante.